I have always been a sucker for a challenge. I think it’s because I’ve found that my best work often comes when I’m down to the wire. (Do you think it’s because I procrastinate much? I dunno.) 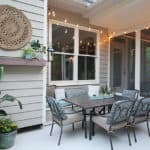 So, when I saw the Spring Edition of the One Room Challenge was happening just in time for me to makeover our screened-in porch and back patio, I didn’t hesitate to commit. 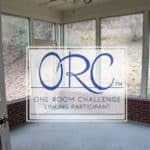 For those of you new to the ONE ROOM CHALLENGE, it is a 6-week long process where we completely makeover a space, and share our progress every Thursday! 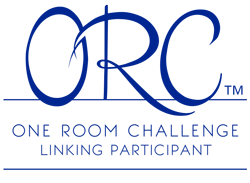 So who’s responsible for this ultimate, get it done idea, room challenge? That would be Linda of Calling it Home. She has put together some fantastic bloggers and interior designers for the event, each will show off their progress on Wednesdays and I will participate on the Thursday reveals. 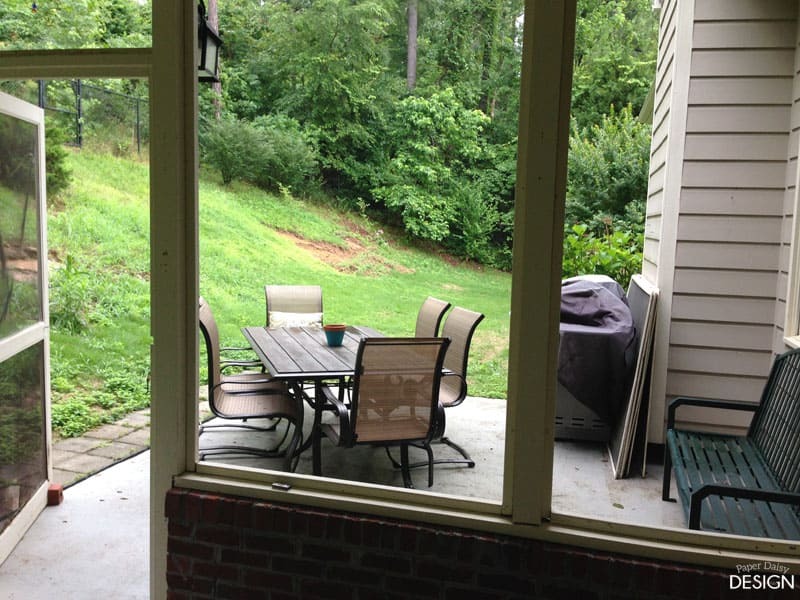 So let’s look at the space I’ve chosen, our screened porch and patio. This photo is from last spring, right after we purchased the house. At that point, I was so excited to actually have a screened in porch that I overlooked how sad and dreary it really was. 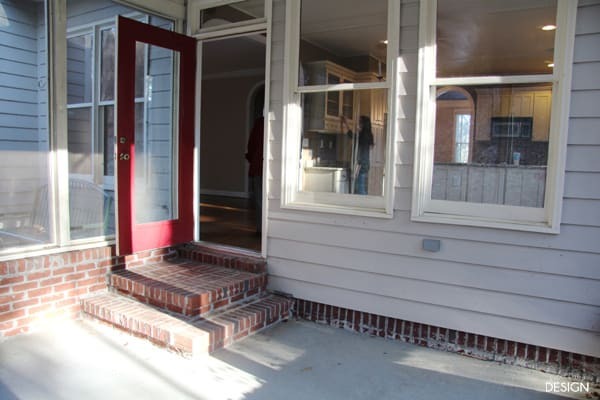 It’s not a very large porch, obviously, and there’s no good way to fix those steps that take up nearly a quarter of the space. The outdoor area is also not large and rather awkward. Our old outdoor table, that got a great new top in this makeover, was not at all right for this space. During the almost one year since we’ve moved in I have collected a few pieces of outdoor furniture to try and cozy up the space, but my design was really just leftover from the back patio at our previous home. We’ve done much of the grunt work like replace the screens and a fresh coat of paint. 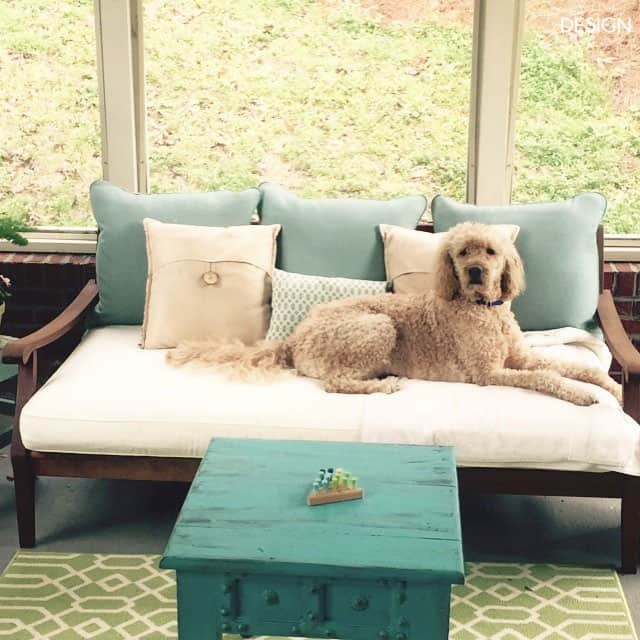 And if you follow me on Instagram, you’ve seen photos of the porch in it’s current state with our golden doodle, Tucker. While this part looks fine, in all honesty the room is just okay. But here’s the deal, the screened porch is right off the kitchen and in full view with only a wall of windows dividing the spaces. So a great design that speaks to the inside is essential. Here are the main issues that will be addressed in the challenge. 1. The Floor. That terrible cold, institutional grey porch paint has got to go. 2. Devise a plan to have outdoor dinning space that functions. The screen porch door is a bit of an issue as is the small footprint of the patio. 3. Create a cohesive design esthetic between the outdoor patio and the screened porch. I’m thinking a combination of a serene color palette and botanical oasis. I have been collecting inspiration on my Outdoor Living Board on Pinterest. 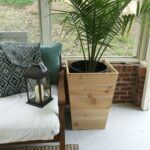 Follow Paper Daisy Design’s board Outdoor living on Pinterest. My favorite inspirational image is probably this one from Southern Living. Thankfully, we have done a lot of the painting already and have gathered the large pieces of furniture for the porch. We have even painted the ceiling in my own version of Haint Blue! 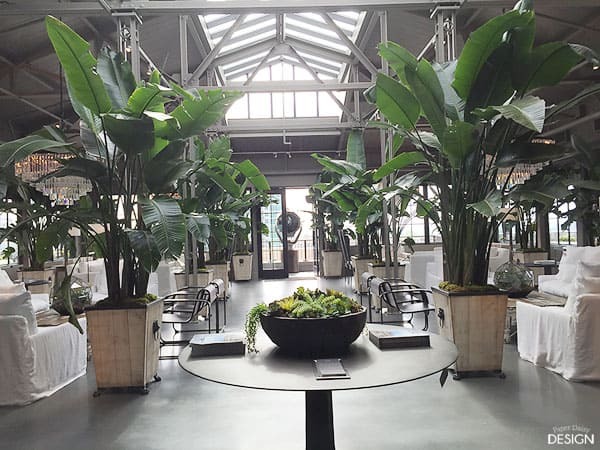 But my recent trip to The Restoration Hardware Gallery at the Estate in Buckhead, confirmed my notions about adding drama, even in a serene outdoor setting. And I was stoked to find their atrium filled with planters similar to the ones I’ve been dreaming of building. Stay tuned. It’s going to be great! I can just feel it. Oh my goodness! SUCH a beautiful space to work with! This will be so much fun to follow along with!!! Can’t wait to see how you transform this little area! It looks like such a neat place to hang out! Looks like you have a few nice pieces to start with. I can’t wait to see how you pull everything together! I’m sure it’s going to look fabulous! Ooh! I’m definitely excited to see what you do with your porch! 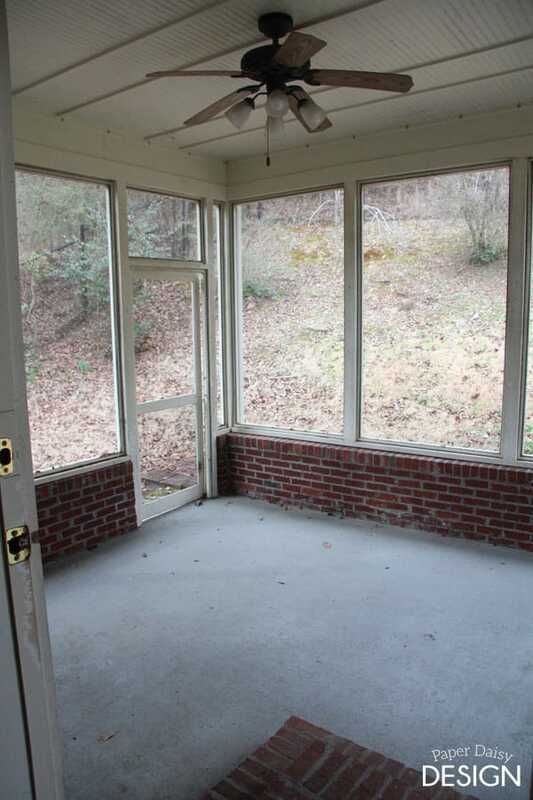 We’ve got a very sad sun porch that I’m anxious to get inspiration for! Corina, I think you’ll find at least a nugget or two to inspire you! Thanks! I am already jealous of your outdoor space! This is going to be such a welcoming space, and I can’t wait to watch for the next 6 weeks. Thanks Linda for hosting this challenge! It’s going to be fun! 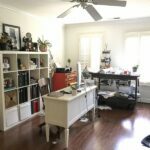 I am really excited to see what you do with this space. It looks like it has already has some pretty big improvements. Love your inspiration pictures. Good luck! Thanks Erin! I’m pretty excited.